the amenities on the train and due to over all gauge conversion in the state, a new broad gauge Palace-on-Wheels has been constructed and has been running since 1995. Its 14 saloons are inter-connected, the interior matching the aesthetics of the royal states. The train also has a well appointed lounge, library, bar and dining cars.In the past 20 years of operations, the Palace-on-Wheels has been rated as one of the best ten luxurious rail journeys in the world. Saloons:The name of the saloons are based on the princely states of Rajasthan – Alwar, Bharatpur, Bikaner, Bundi, Dholpur, Dungarpur, Jaipur, Jaisalmer, Jhalawar, Jodhpur, Kishangarh, Kota, Sirohi, and Udaipur.The decor of each saloon highlights the cultural ethos of the state, represented through the use of furniture, handicrafts, paintings and furnishings. The ceiling in the lounge is of particular interest. Each coupe is different but the overall ambience of the decor of the saloons has been taken care of to provide continuity.Each saloon has cream yellow color on its exterior walls and bears the Coat of Arms (logo) of the erstwhile princely states, along with the name.Interior Layout:Each saloon has four coupes (sleeping rooms) with attached toilet. In every saloon, there is one saloon captain valet and one attendant to look after the personal needs of its tourists. Each saloon has a mini-pantry properly equipped to provide ready tea/coffee and snacks. Delhi: You will be treated like a Maharaja & Maharani as you be welcomed by garlanding, Tikka, turban and a glass of wine. The Capital city of modern India is known for its rich valorous and exotic history.Once the fabled city of the heroes of the Mahabharata, it was ruled by the Rajputs before they were displaced by foreign invaders. The tour starts in the evening with a ceremonial welcome aboard the Palace on Wheels at Safdarjung New Delhi. You will be introduced to your fellow travelers. Feel free to explore your new palace, and acquaint yourself with its various facilities. Relax with a drink at the bar. Dinner will be served on board in its two restaurants. Day 2 – ThursdayArrival 3.45 am Departure 11.30 pmJaipur: Your tour begins at the Hawa Mahal Palace of wind followed by the amazing Jantar Mantar-Astronomical Observatory which will be explored at leisure. Visit the home of erstwhile rulers. The city palace is now a museum of full royal splendor. Jaipur also offers a great shopping experience since the city is the country’s capital as far as handicrafts are concerned. This includes a very extensive range. The city is also known as a major international center of cutting and polishing of gems and stones. Also, Jaipur is well-known for hand block printing on textiles. Lunch at Amber Fort. Soon after reaching Amber, you can enjoy the festively decorated elephant for a ride up to the fort.The lunch visit to Amber Fort is the best example of splendid fusion of Rajput and Mugal styles of architecture.The hall of victory Jai Mandir has a stunning ceiling adorned with mirror work on an inlaid panel. Return back to train by bus to freshen up. After rest awhile, enjoy sumptuous dinner in one of the best hotels of Jaipur. 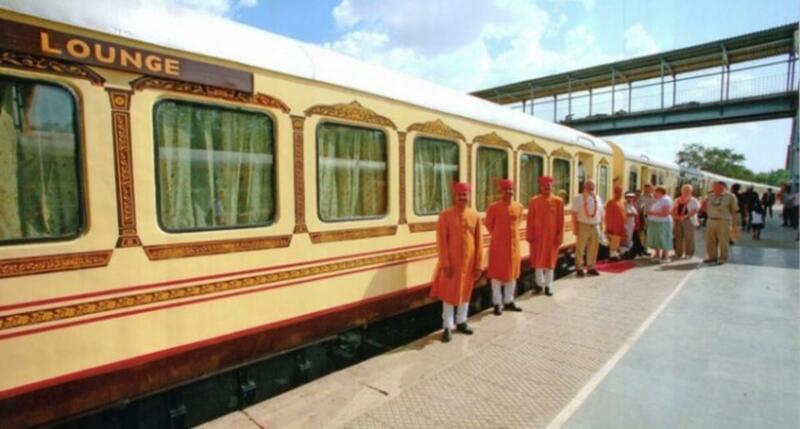 Return to Palace on Wheels. New arrangement from this season:1. Lunch venue at famous Amber Fort.2. Jaipur by Night.3. Visit to Albert Hall.4. Dinner, Bar-be-que, Folk Dance at 5 star hotel Jai Mahal, an old palace of Rajput rulers.